The first of this Friday’s double-header in La Liga comes from Montilivi where two of the division’s smaller clubs meet. Both Girona and Getafe are having good seasons though, riding high in the top half heading into this one. The visitors could climb into 5th with victory and that will certainly be the objective for the South Madrid side. Getafe have largely crept up unnoticed, as is largely their style. While they lack glamour and rarely play particularly exciting football, their results of late have been very impressive. They come into this one with just one defeat in their last 10 matches and with 3 wins from their last 4 in all competitions. Having narrowly missed out on Europa League football last term, they are starting to look like real contenders to make amends this time around. Girona are only 3 points and 3 places further back but they have just started to wobble a bit in recent weeks, to some extent because of a bit of an injury crisis that has robbed them of the services of their in-form keeper as well as the likes of Marc Muniesa and Patrick Roberts. They’ve lost back-to-back games heading into this, although the odds were always likely to be against them at Sevilla last weekend. Even during their impressive run of results, Girona were riding their luck at times and overall they’ve been less impressive than Getafe. The Catalans don’t have a great home record either with just 1.13 points per game in front of their own fans this term, only the 15th best in the division. They are one of a number of sides who seem more content playing on the road where they average more points. Getafe have been very solid on the road, losing just 1 of their 8 away games so far in La Liga this term. They have drawn the majority of those but you have to go back four months to the opening day at the Bernabeu for their last defeat away from home in La Liga. When you consider they also won all of their final four away league games last season, that’s quite a record and it strongly suggests that Getafe will at the very least get a point here. Girona are unbeaten in their last 4 league games against Getafe. They took 4 points from the only previous top flight meetings last term. The second game this Friday in La Liga is a Basque derby at Real Sociedad’s Anoeta. Alaves are the visitors hoping to avenge two defeats against La Real last term. It is the visitors who are having the better season overall but on paper, they have less all-round quality than their regional rivals and they are still the clear underdogs heading into this match. Sociedad are now 18 games into the reign of Asier Garitano and it’s probably fair to say the jury is still out. He has had a fair few injuries to contend with but La Real head into this match having lost 3 on the spin in La Liga. That has seen fall from the fringes of the top six to the bottom six but they could rise to as high as 8th with victory on Friday night. Alaves fans are certainly not doubting their boss with Abelardo doing a wonderful job in Vitoria. He has been at the helm for just over a year now and has totally transformed this side. Their success this term has largely come courtesy of pretty solid defence and organisation coupled with a bit of genuine quality on both flanks with Ibai Gomez and Jony continuing to impress. However a few doubts must be creeping in for Alaves too after four straight away defeats. In truth they don’t really have enough quality to maintain a top six challenge but they are a disciplined side and Sociedad have been struggling to put the likes of them away this season. The local derby aspect adds an extra bit of spice and overall a fairly scrappy game looks likely between two sides that won’t be particularly high on belief. Backing the Draw could be the best move in the Full-Time Result market. Sociedad won both meetings last term. They’ve taken 10 points from their last 4 home league games against Alaves. 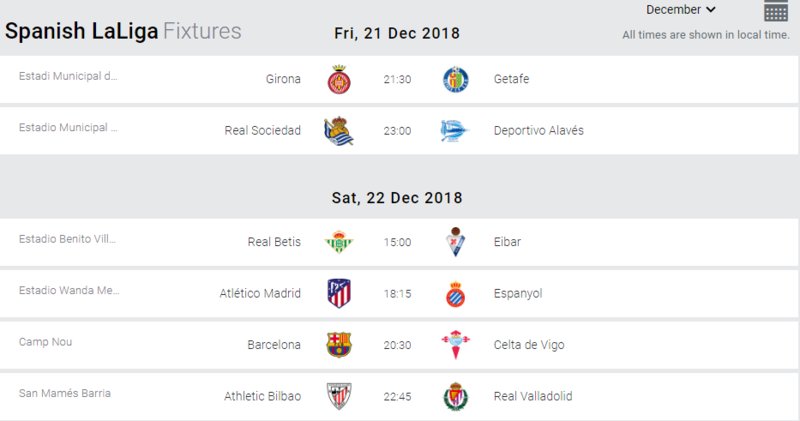 Both Real Betis and Eibar have had some memorable wins already this season and they will both be out to end the calendar year on a high when the sides clash in La Liga in Seville this Saturday. Betis are one of the real form teams in La Liga and would be just a point off the top four were they to win this. A Champions League push may be just beyond them, particularly given they will also be involved in two cup competitions in the new year but any doubts about Quique Setien’s side are increasingly being swept away. Betis head into this match having won 5 of their last 6 in all competitions and having lost just 1 of their last 11. As for Eibar, they’ve drawn three on the bounce and are yet to win since beating Real Madrid so impressively at Ipurua in late November. They were good value for their 3-0 win that day but have been held to frustrating home draws by the Valencia clubs since then, with the late goal they conceded in the 4-4 thriller with Levante a particular source of frustration. This will be a real contrast of styles with Betis favouring a possession-based approach while Eibar still tend to favour attacking down the flanks and getting lots of crosses into the box. Right now though, Betis look very impressive indeed and on current form it’s hard to go against them at home. They’ve won all of their last 4 at the Benito Villamarin to nil and will be backed by another big crowd here with average league gates of 46,000 this term, the 4th best in La Liga again. The last 4 meetings between these clubs have all produced home wins (2 each). Eibar beat Betis 5-0 at home last term but have lost on 3 of their last 4 trips to Betis, the exception being a 4-0 win in 2016. The second game this Saturday in La Liga comes from the Wanda Metropolitano where Atletico Madrid play host to Espanyol. The visitors are in desperate form all of a sudden after an excellent start to the season. They are huge underdogs here but can take some comfort from having bizarrely done the double over Atletico Madrid last term. Indeed they remain the only visiting team to have won a league match at the Wanda but it is worth noting that there was very little riding on that game. Atleti were more interested in keeping fresh for their Europa League exploits and it’s very hard to see a repeat here. Diego Simeone’s side haven’t totally convinced this season but despite that they remain only 3 points off the top, a decent position to be in heading into 2019. It has already been a season of two halves for Espanyol meanwhile. They were riding high in the top four for the opening few months but Rubi’s revolution has come to a shuddering halt of late. They come into this game having lost 5 straight league matches having only lost 2 of their opening 11. The latest setback was a 3-1 home defeat to Betis last weekend and they’ve completely lost their way in their defensive third. It has been a radical regression for a side that looked very solid at the back earlier in the campaign but they’ve now conceded 3 or more goals in each of their last 4 league games and an injury to centre-back Mario Hermoso won’t help matters. At the other end, they’ve been very dependent on Borja Iglesias for goals but did at least find an alternative source for a goal last time out, with Sergio Garcia on the score sheet against Betis. Espanyol surprisingly did the double over Atletico in La Liga last season. They’d not scored on any of their previous 5 league visits to play Diego Simeone’s side though, losing 4. Barcelona are bidding to take advantage of Real Madrid’s trip to the Club World Cup by opening up an 8 point advantage on their eternal rivals in La Liga with victory here. They host a Celta Vigo side that has at times caused them problems in recent seasons, although mostly at Balaidos rather than Camp Nou. The Catalan giants come into this game following two dominant league wins on the road. They hammered Espanyol 4-0 in the Barcelona derby before going one better and putting five past Levante last time out. 5 of those 9 goals were scored by Leo Messi while the Argentine assisted 3 of the other 4, in two performances that even by his standards were exceptional. Celta Vigo won’t exactly be looking forward to facing a red-hot Messi here. This will be their 6th game under new boss Miguel Cardoso and so far it’s two wins, two defeats and a draw for the Portuguese coach. They would have been disappointed to only draw 0-0 at home to Leganes last time out and this is likely to be a totally different kind of game. Barca clearly will play on the front foot and this has the potential to be a really good contest if Celta continue with their naturally ambitious style. The Catalans have scored 17 more goals than any other team in La Liga this term. The last 6 meetings have produced 2 wins each and 2 draws. Celta have lost on 3 of their last 4 trips to Camp Nou though, conceding 5 or more in each of those defeats. This Saturday’s late game in La Liga is a pretty big one in the wider context of the relegation scrap. Before a ball was kicked this term, Real Valladolid looked far more likely to be in that battle than Athletic Bilbao but were they to win here, they’d have 23 points on the board and would be 8 clear of the drop-zone. An Athletic win would really bunch things up though and the new boys would still have a huge amount of work to do in the new year. Valladolid have underlined the Primera Division qualities they do possess over the past fortnight. They were impressive winners in this part of the world, beating Real Sociedad in their most recent away game and gave Atletico Madrid a bit of a fright last weekend, coming from 2-0 down to level the game before succumbing to a late Antoine Griezmann strike. As for Athletic Bilbao, they have picked up a bit since deciding to sack Eduardo Berizzo, the first time in over a decade that they have made a mid-season managerial change. Gaizka Garitano has instantly found the magic formula for tightening their defence up. They are yet to concede in 3 games under the new boss having only kept 2 clean sheets in 16 under his predecessor. This has the potential to be quite a low-scoring game. With the stakes high between two sides that have to be viewed as in danger of going down, there could be an element of caution, certainly in the opening stages. Valladolid would be more than content to come away with a point so they are likely to defend deep and deny the likes of Inaki Williams any space to run into. Athletic won both meetings the last season Valladolid were in the top flight (2013/14). The sides haven’t met competitively since. Athletic have won all of their last 5 home games against Valladolid by 2 goals. This Sunday’s clash at the Mestalla sees a Valencia side that have only recorded one home win this season in La Liga take on a Huesca team that has only won once anywhere. Something has to give here and Los Che are the clear favourites to claim all the points and condemn the minnows to bottom spot heading into 2019. Valencia’s struggles have been one of the mysteries of this season in La Liga and for perhaps the first time there will be genuine pressure on their boss Marcelino if they fail to win this match. He worked wonders last term which has bought him a bit of time but there was a fair amount of discontent during their last home league game against Sevilla and victory over Manchester United in a Champions League dead rubber since then hasn’t really changed that. As for Huesca, things are already looking pretty hopeless. They at least ended a four game losing streak in all competitions last time out by scoring a late goal to rescue a point against Villarreal. It was a significant goal against the team in 17th as they’d have been 10 points from safety had they not scored it but they desperately need a win from somewhere having not tasted victory since the opening day. It’s hard to see this game producing a huge number of goals. Both teams basically have the same problem in that although they’ve been creating chances, they’ve been failing to convert them. The fact they sit bottom and 2nd bottom of the goalscoring charts certainly demonstrates that with Huesca averaging just 0.88 goals per game while remarkably Valencia are even worse at 0.81 per game. That surely at some point has to rectify itself but the failure of the likes of Rodrigo and Goncalo Guedes to replicate last season’s form in the final third has been a major issue. Even so, they should have enough class to see off a Huesca side that has lost all of their last 6 away league games. All of the last 5 produced under 3.5 goals in total and they ought to be competitive enough here but it’s hard to see Valencia’s superior quality not showing over 90 minutes. This will be the first ever league meeting between the clubs. This is a really interesting game this Sunday and it will be a real test of Sevilla’s burgeoning title aspirations. If they can leave Leganes with three points they will have already eclipsed what the likes of Barcelona and Atletico Madrid managed on this ground but that may be easier said than done against an in-form Lega side who will be hoping to push themselves into mid-table of La Liga with a win here. The Madrid side took a little while to get going this term which was perhaps inevitable following some key playing and coaching departures over the summer. However they really have established themselves as a tough side to beat again and they’ve been getting results both home and away which can only bode well for their long-term survival prospects. Sevilla will also be delighted with how things are going. They recorded a 10th straight home win in all competitions last weekend to see off Girona 2-0 and hold onto 2nd place. They are currently very much in the title picture but there is a lot of football to be played and in truth it is tricky away matches such as this that may well determine whether or not they are genuine title hopefuls. Overall, Leganes do look capable of getting a result here. Their home record is impressive this term with just 1 defeat in 7 matches and an average of 1.71 points per home game. When you consider they have already hosted 3 of the current top six and will have taken on all of the current top three at home after this match, that’s certainly a record they can be proud of. They are also in good overall form with no defeats in 8 matches now in all competitions. There’s not a lot wrong with Sevilla’s form either but there is still a sense that they aren’t totally convincing travellers and their recent road results really does back that up. They’ve only recorded one victory from their last 8 away in all competitions and that was against Akhisarspor, the bottom side in their Europa League group. You have to go back to September for their last away league win and Butarque is not an easy place to come seeking an end to a run such as that. The sides met 4 times last season with both league games ending in home wins while Sevilla won a Copa del Rey Semi-Final between the sides with a home win in the 2nd Leg. They’ve only won on 1 of their 4 visits to Butarque this century. This is a really significant game for Rayo Vallecano. With just 10 points on the board, they could desperately do with a morale boosting win here to give them a fighting chance of staying in La Liga heading into 2019. They are the favourites to get it but it won’t be easy against a Levante side that has been having an excellent season. The Valencia club were on the wrong end of a heavy 5-0 home defeat against Barcelona last weekend but the scoreline didn’t quite tell the story of what was largely an end-to-end contest. They at least won’t have to deal with Leo Messi here with the Argentine scoring or creating all five goals in that match and Levante will take confidence from a run of just 1 defeat in 11 matches in all competitions prior to that. As for Rayo Vallecano, they’ve won just 2 of their 16 matches on their return to La Liga. One of those did come in their most recent home league outing against Eibar however that hasn’t really acted as much of a building block with 3 straight defeats in all competitions since then. They performed reasonably well at the Bernabeu last weekend but didn’t get anything to show for their efforts. Rayo Vallecano have won their last 3 at home to Levante. All of those games produced over 2.5 goals and saw both teams score as have 4 of the last 5 meetings overall.